Like I said, Dante was amazing. It followed the early life and induction of the famous Chapter Master into the Blood Angels, as well as a bit of his rise through the ranks. All of this was intercut with much shorter scenes during the tail end of the Cryptus campaign. This, of course, was the campaign we saw during the Shield of Baal campaign series. The Devastation of Baal is a sequel to that, written by Guy Haley as well, but really it only follows on from the Cryptus scenes. Dante was very much about Dante, understandably. Devastation instead spends its time split amongst several key characters, including Dante. The first book was a character study, this one is much more in line with what the series title implies, Space Marine Conquests. It's a battle book first, detailing the events of the assault on Baal. This doesn't mean it forsakes character moments and growth though, since Guy Haley is adept at balancing both. The book opens as the Blood Angels have retreated to Baal, abandoning all of the other worlds under their protection. Not only have they abandoned them, but they have destroyed several of the worlds themselves to deplete the Hive Fleet of the resources it would have harvested from them, civilian population and all. While in the last book we just saw the Blood Angels and Flesh Tearers in action, here we get almost every Blood Angel Successor Chapter that exists. They have all been called back to the world of their parent chapter to try and help save it from extinction. A point that is made many times throughout is that they do this of their own free will. Even though the Blood Angels were the first founding Chapter, that doesn't give them supremacy over the others. There is a moment early on where an Angels Excelsis Strike Cruiser runs into an ongoing battle on their way to Baal, and the Blood Angel captain in charge of that battle tries to give a direct order to the Angels Excelsis captain. This is promptly ignored and the Angels Excelsis go on to do what they want, which incidentally ends up working better. Once on Baal itself the defenses are shored up, and we get a bunch of detail about the Chapter keep. This is all really fascinating stuff, and Guy does a great job at making it feel real, lived in, and suitably weird in a traditional 40k format. We even get a brief glimpse of Baal Secondus, one of the planet's moons and recruiting world, and also where the majority of Dante took place. The civilians left on the moons are basically drafted into service to act as front line troops in the defense. Before the assault itself happens we get a bunch of scenes of the Chapters preparing in various ways. We see Mephiston meditating in his personal chambers, which in themselves are really interesting in their metaphysical nature. He foresees what will eventually become the Great Rift and the Chaos that will follow it into real space. It's also worth mentioning that not all of the Chapter is present, since Astorath the Grim and the 5th Company are at Cadia fighting, which gets mentioned here and there. In one of the most interesting scenes for me, Dante throws a grand feast for all of the gathered Chapters, where they elect their overall leader for the rest of the campaign. We also get to see how all of the Chapters interact with each other, as well as some surprise visitors that Dante isn't too pleased with. Some of my favorite bits though are the interactions between Dante and Gabriel Seth of the Flesh Tearers. Guy does a fantastic job at making Seth a complex character, who is trying to reform himself and his chapter, but is constantly fighting his own rage. Once the battle itself begins it's pretty much non-stop action, but in a good way. We still get plenty of character moments, but it's set amongst the carnage of the tyranids. On Baal we mostly follow Dante and the Blood Angels as they enact several plans to stall the hive mind. One of which is a really cool callback to a very imaginative bit from Dante. It's also nice seeing how a Chapter Master tries to coordinate a battle between several different Chapters. During this we also spend a little bit of time with Mephiston, who's off doing his own thing, which I won't spoil here. On Baal Primus we follow Seth and the Flesh Tearers, as they set up a defense to repel the tyranids, something that is almost anathema to them, since their instinct is just to charge headlong into the enemy. They have been partnered up with another Chapter against their wishes, the Knights of Blood. The Knights have fallen even further than the Flesh Tearers into rage and act as a twisted mirror of the possible future for Seth's chapter if he's not careful. There is also a rather cool bit involving a tyranid lictor which runs through a lot of the book and is fairly integral to what ends up happening. Without spoiling the ending, we are carried through into the events described in the 40k rulebook, and get some of the best scenes between the oldest living Space Marine and a demigod in the flesh. The action is spectacular throughout, and never once did I feel like it was falling into any of the easy tropes of a Space Marine book. Some of my favorite parts though are when we get to take a closer look at the characters we're following. If you're familiar with this event already, you know that many of the Imperial forces don't survive, so there are quite a few characters that are set up as important, who abruptly die halfway through. This adds a level of realism to whats going on, and ups the emotional stakes a bit since we know there are certain characters that just can't die for lore reasons. Dante's arc is carried over from the last book, and we get to see how he deals with the likely failure of his plan and the extinction of his lineage. Seth is spectacular, and steals every scene he's in. I especially like how they set him up at the end, giving him one of my favorite lines from the book. Seeing how he handles the Primaris Marines and Guilliman in the continuing storyline will be a fascinating bit of lore. The Space Marines aren't the only ones to get attention though, and the hive mind is explained and explored in ways I have yet to see in any 40k fiction, giving us a better understanding of just how alien this intelligence is. If you've read Dante, then you'll definitely appreciate this book. It continues the storyline on in a spectacular manner, and has enough nods and call backs that you'll be satisfied. 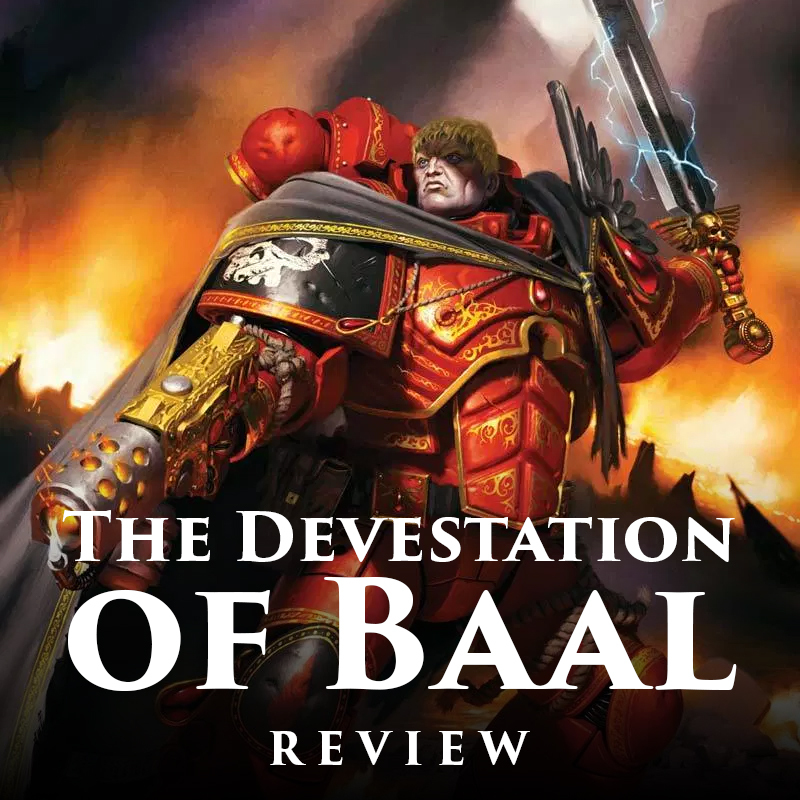 If you haven't read the first book, The Devastation of Baal does a good job of setting everything up enough that anyone can jump in and enjoy it. This is one of the defining moments in the new storyline of 40k, and Guy Haley more than lives up to the task of writing it. I really liked this book and would highly recommend it to all 40k fans. Like I said, it's such a pivotal moment, and here we get the small blurb from the 40k rulebook expanded out into a full novel. If you're a Blood Angels fan then it's a definite must read. I really hope that we'll see more Blood Angels novels from Guy Haley, continuing on from where this series left off. With his ongoing Dark Imperium series we could even see the two combine and intersect more.